Testing in public beta, BBC's Sound Index determines a music artist's popularity based on what people are blogging about, listening to, watching, and downloading, with updates every six hours. The Sound Index crawlers comb through data from partner sites Bebo, MySpace, Last.FM, iTunes, Google, and YouTube, tallying the most blog mentions, comments, plays, downloads, profile views, and search queries associated with an artist, and ranking them among the top 1,000 most popular. The anitquity-approaching Billboard Hot 100 only comes out once a week, and bases its rankings on Nielsen SoundScan data and Arbitron research company's airplay metrics. Though it and CMJ are considered industry standards for measuring a musician's popularity, both fail to capture "buzz." Since the service is still in beta, and data is only collected from participating sites, the BBC's Sound Index accounts for little more than a rough estimate. It does, however, begin to quantify the formerly elusive "buzz" factor: excitement and interest surrounding a particular artist or band. Unfortunately, the list does not separate new artists from old. 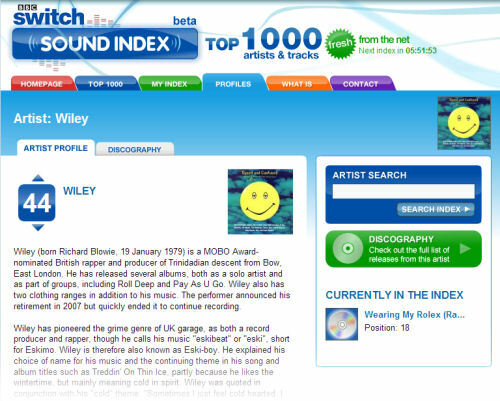 The Beatles are currently nestled in the list at #49, just between current Pop band Paramore and UK Garage/Grime pioneer Wiley. In BetaNews tests this afternoon, we discovered that while it's too early to tell whether the BBC's popularity estimates are accurate, its ability to match content with context may need some help. In this screenshot that's supposed to pertain to the musician Wiley mentioned earlier, the artist's picture is actually the cover of the soundtrack to the movie Dazed and Confused. The artist Wiley is not on this soundtrack. However, one of the actors in the film is named Wiley Wiggins, thus demonstrating how deducing context from text alone may be a bigger problem than the BBC anticipated at first. For instance, suppose Wiley Wiggins' role in that well-named movie happened to elicit Oscar nomination discussion; would the musician Wiley's rank rise in tandem? Or would an online discussion of the publisher of the popular For Dummies series have the same effect?